Ischgl is situated just south of the St Anton ski resort close to the border to Switzerland; so close to the border that the resort extends across it and into the valley of Samnaun, so you have the tough choice deciding between lunch in Austria or Switzerland. With over 200km of slopes and 42 lifts Ischgl offers one of the largest variety of slopes for any level and style of skier, or boarder, to satisfy their passion. 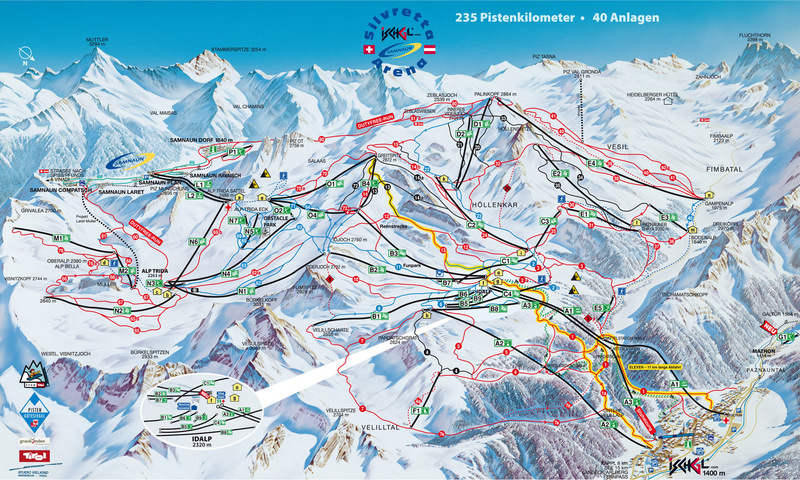 Check out the piste map (top right of this page) and don't hesitate to contact the trip captain for more information. The bus will leave EUMETSAT at 15:45 and from ESOC at 16:00 on Thursday the 20th of March. We will arrive in Ischgl on Thursday night. On Sunday, we leave the slopes around 16:00 and drive back to Darmstadt.